With the enactment of Bill C-10, The Safe Streets and Communities Act, mandatory minimum sentencing in Canada is at an all-time high even as crime rates have been dropping steadily, and are at their lowest point since the early 1970s. Mandatory minimums set a floor below which judges cannot sentence, even if to do so would be the proportionate sanction in the circumstances. Canadian judges do not retain any residual discretion to sentence below the minimum floor. In this regard, Canada is increasingly out of step with other comparable jurisdictions, such as the United States, where efforts are being made to restore sentencing discretion to judges. The BC Civil Liberties Association undertook this research to provide a comprehensive look at the financial, social and legal implications of mandatory minimum sentencing in Canada. The research shows that “tough on crime” measures, such as mandatory minimum sentencing, do not achieve their stated objectives. Instead of promoting certainty, transparency and equity in the justice system – all rationales that are frequently cited in favour of mandatory minimums – these sentences shift discretion away from judges to prosecutors, with the result that decisions that affect sentencing are ultimately less open and transparent. They have no demonstrable effect on deterring criminal conduct, and to the contrary, may increase the likelihood of recidivism. 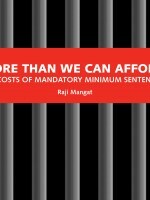 Mandatory minimum sentences also have a disproportionately negative affect on certain individuals, such as those living with drug dependence, Indigenous peoples and the mentally ill.